Engaged Learning Fellow Natalia Perea (B.F.A. Dance Performance, B.A. English ’15) will showcase her photography exhibition on the passionate flamenco dance culture in Jerez de la Frontera, Spain in a gallery opening event on Thursday, April 9th, 2015 from 6 p.m. to 8 p.m. in the Doolin Gallery. This exhibition, made possible through an Engaged Learning Grant and a Meadows Exploration Award, will feature original photographs by Amaya Perea and is curated by Natalia Perea. José Cortes Fernandez, a famous flamenco cantador (singer), will perform during the duration of Perea’s exhibition and in addition to Thursday’s event, the gallery will be open Friday, April 10th from 8 a.m. to 6 p.m. This multifaceted exhibition was birthed out of Perea’s passion for flamenco as well as a long journey of travelling and studying. Perea spent several weeks in Jerez before traveling to her four-month-long study abroad program in Madrid, Spain. After her studies abroad, Perea explained that she wanted to bring back the spirit of Flamenco. Perea grew up dancing Flamenco with her sister, Amaya, who now dances professionally. In her final project, Perea knew that she wanted to combine her love for language, writing, community and dance. “I wanted to bring all the mediums I could use to bring back the taste of flamenco,” Perea said. 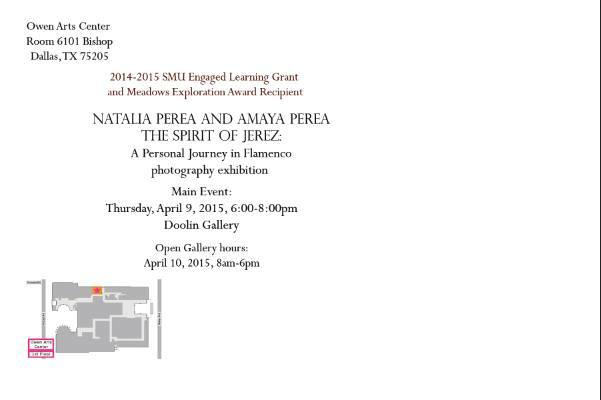 At Thursday’s event, attendants can expect live music and photographs from Perea’s trip. Perea, who has interests in writing, poetry, dance and visual art, has had a similar experience. Her event is also sponsored by the 2015 Dallas Flamenco Festival and FlamencoDNA. For more information, visit Nataliaperea.com and Amaya Perea Photography.